This record seems to have defied the odds with how good it is. Contract obligation albums have often not been the best representation of rock groups, and in the case of Buffalo Springfield, they had already gone their separate ways by the time this one was released. The tracks had been recorded months earlier in late ’67-early ’68. But producer Jim Messina, who also played bass and sang on a couple of songs, pulled a very good swan song album out of the void of participation by the others. The other side of the coin for Last Time Around, released 50 years ago today, is that it is really more of a collection of solo songs. The opening track, On the Way Home, is the only song with all five original members participating. The lyrics to one of the tracks, The Hour of Not Quite Rain, were actually written by a fan who won a radio station contest, something that seems more fitting for a Monkees bio. And even that’s an enjoyable listen to my ears. The upbeat Latin flavored Uno Mundo, one of five Stills penned songs, features a rather dark lyric for such a happy sounding song: Uno Mundo/Asia is screaming/Africa seething/America bleating/just the same. Stills took a bit of a hit with critics, who wrote that his contributions weren’t up to his standard. I don’t hear it that way; his other songs, Pretty Girl Why, Four Days Gone, Special Care (with Buddy Miles on drums), and Questions (which he later revived for on the CSN&Y song Carry On) are all fantastic tracks. It was the mercurial Neil Young whose participation was next to nil on this project. Despite this, the two tracks he did write for the album went on to be classics: I Am a Child and On the Way Home (the latter sung by Richie Furay on the album, though my favorite rendition is with Neil on vocals). The closing track is Furay’s Kind Woman, a ballad for his wife who he is still married to today. It’s a nice, peaceful ending to a tumultuous three years for a very heavily ego-driven band. The album could be looked at as an embarrassment of riches considering how much great music they recorded on the first two albums and knowing where they were headed in the immediate future: Furay and Messina would form Poco, the very influential early country-rock band, Neil would record his first solo record before rejoining Stills, along with Crosby and Nash, on their second album. And Stills, before joining CSN and a mere two days before Last Time Around was released, would have his name featured on a highly acclaimed blues rock album with Al Kooper and Mike Bloomfield (which I wrote about here). A very solid bio of the band is For What It’s Worth: The Story of Buffalo Springfield (2004). It was written by respected music history writer John Einarson with Richie Furay. It seems like a pretty even-handed account of their story, and is bolstered by Furay, who appears to have been the most level-headed member of the group. Like a Cadillac in Alabama, it seems I’ve got a wheel in the ditch and a wheel on the track. I’m almost out of it, but before moving on to other topics I want to mention a couple of remarkable live recordings from those incredibly creative and productive days for Neil. Perhaps that’s something I haven’t emphasized enough: As heavy and gloomy as much of the Trilogy material is, Young basically never ceased working – a trait of his that continues to this day. Anyway, one of these recordings is a widely circulated bootleg from an audience tape, and the other a recent official stand-alone release from Neil’s Archives. One mark of a confident songwriter is to take new, previously unheard material before a live audience. In Neil’s case, we aren’t simply referring to a musician who inserts a couple of new tunes into a set list of oldies, often giving a large number in the audience the opportunity to head for the restroom or concession stand. On May 16, 1974, he played a surprise, unadvertised solo acoustic set at New York’s Bottom Line club after Ry Cooder’s scheduled set, and thankfully someone had a tape recorder. In just over an hour, Neil played 11 songs interspersed with funny, stoney storytelling. Amazingly, five of the eleven songs were début performances and 10 of the 11 songs were unreleased at the time. Four songs were from his just-completed On the Beach album which would be released exactly two months later. Another tune was from Tonight’s the Night, which wouldn’t be released until the following year. Still another would find a home on Zuma in late ’75, and one was from the future (’76) Stills-Young album, Long May You Run. Arguably the most stunning track is the one which opens his set, Pushed it Over the End (which he introduced as Citizen Kane, Jr. Blues). The only official release of this song is on the CSNY ’74 set released in 2014, but in my opinion the Bottom Line performance is much better. Both Neil and the club audience are loose, and among the humorous stories he tells, we learn that the upcoming On the Beach release was recorded under the heavy influence of a concoction he calls honey slides, its recipe he shares with the appreciative crowd. The sound quality of this recording is actually quite good considering it’s an audience tape, so slide on your headphones and enjoy. Released just a couple of weeks ago on April 24, Roxy: Tonight’s the Night Live once again captures Neil Young trying out new material in front of a club audience. This time we hear Neil and the Santa Monica Flyers on the opening nights of the Roxy in Los Angeles, between September 20-22 of 1973. Graham Nash and Cheech & Chong performed opening sets before Neil and Co. took the stage for a set which covered, from start to finish, the tracks they’d spent the summer working on that would ultimately appear on Tonight’s the Night when it was finally released in 1975. Also performed was Walk On from the following year’s On the Beach. Since this was the first time the songs were heard by a live audience, Young stayed true to the studio arrangements, something he doesn’t always do. However, as is often the case, the live versions here are punchier and warmer. The material may be bleak, but Young is definitely in a livelier mood. I listen to the Bottom Line set above as much as any other release of Neil’s, and this Roxy release has found an instant home in my rotation. It’s great stuff. Enjoy, and thanks for reading! Today we revisit On the Beach, the final link in Neil Young’s Ditch Trilogy, which put on full display not only Young’s state of mind in the early 1970’s, but also the zeitgeist of America. As discussed in my previous post, while On the Beach was the last of the three to be recorded, it was actually the second to be released, as well as the long-awaited studio followup to Harvest. Therefore, even though the songs weren’t quite as caustic as Tonight’s the Night and the production a little cleaner, it was still a shock to fans expecting a radio-friendly offering. The album was recorded over two months, from February to April 1974. By the time it was released on July 16, Neil had moved on and was a month away from CSNY’s reunion mega-tour (perhaps worth a write-up itself). Unlike his previous studio efforts, Neil enlisted the help of numerous musicians instead of a core band, including Rick Danko and Levon Helm of the Band. Also of interest to fans and critics is the album jacket with its gaudy 70’s lawn furniture and pale yellow motif – even on the inside – right down to the can of Coors resting on the table and the fin of a Cadillac half buried in the sand like a crashed rocket (from better days?). Under the table rests a newspaper with the headline: Senator Buckley Calls for Nixon to Resign. On the back of the jacket stands a solitary, rather pitiful looking palm tree in a pot. Neil’s blazer makes him look like he just stepped out of the Monday Night Football broadcast booth with Howard Cosell and the gang. Well, maybe not, but you get the picture. Neil’s art director was Gary Burden, who passed away less than a month ago at the age of 84. Burden also worked with Joni Mitchell, the Doors, and My Morning Jacket, and collaborated with famous rock photographer Henry Diltz. I first listened to On the Beach when I managed to find a new-but-cut-out LP in the early 90’s when it was out of print, and it’s been in my regular rotation since. I went without it for a couple of years when I foolishly lost track of my small LP collection, but replaced it on CD when it was re-released in 2003. I’d like to wrap up Neil Young’s Ditch Trilogy with a bit of unsolicited social commentary: While I don’t consider myself to be in a personal rut despite my enthusiasm for these emotionally charged albums, with regard to On the Beach, it feels very apropos of the current atmosphere in the US in my perception. Coincidentally, a certain president is speaking at the convention of a certain organization of gun enthusiasts in my town on this very day. I don’t know where we’re headed, and this album captures that mood perfectly for me. 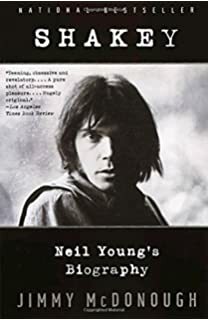 In addition to the online citations I’ve included at the bottom of each edition of this series, I’d also recommend Jimmy McDonough’s solid biography of Neil Young, Shakey, which was published in 2002. I’ll have a postscript to this little series next time ’round. I’m sorry. You don’t know these people. This means nothing to you. – Neil Young, in the liner notes to Tonight’s the Night. Recorded in August and September of 1973 but not released until June of 1975, Tonight’s the Night was the first studio album Neil recorded after the drug-related deaths of friends Bruce Berry and Danny Whitten the year before, and it’s even more jarringly raw than its live predecessor, Time Fades Away, which wasn’t released until the month after the recording of Tonight’s the Night was wrapped up. Confused? Neil’s timeline from these years is almost as sloppy as his music, and that’s just fine with me. This album is a no holds barred perpetuation of his abrasive, unapologetic catharsis. He had money and fame; he could’ve slipped away from the public eye for a spell to deal with his grief in private. Instead, he continued to share the trip into his personal heart of darkness with his fans because that’s what true artists do, take it or leave it. Critics mostly took it from the day of its release, while his fans were a little slower to catch on to the beauty of its many imperfections. But they did eventually. Tonight’s the Night was recorded mostly live in the studio, primarily during one session in August, with his professional-yet-ragtag group the Santa Monica Flyers, featuring the Crazy Horse rhythm section of Ralph Molina and Billy Talbot, and a 22-year-old Nils Lofgren on guitar. Right in the middle of the record is a creepy and haunting reminder of what it’s all about: a live recording of Neil with Crazy Horse at the Fillmore East in 1970 with the late Whitten on vocals singing Come On Baby Let’s Go Downtown, an upbeat rocker which makes light of the drug scene which ultimately consumed him. The back of the Tonight’s the Night jacket. I first delved into Uncle Neil’s catalog at the age of 18 in 1989 upon the release of Freedom. That album, plus Ragged Glory, Rust Never Sleeps, Live Rust, After the Gold Rush, Harvest, and Everybody Knows This is Nowhere, was in my blood before I took the plunge with Tonight’s the Night. I had picked it up, studied it, and returned it to its slot at Streetside Records on more than one occasion over a period of two or three years in the early 90’s. I listened to it for the first time without a good understanding of what went into it and liked it, but only because I’d steeped myself in those albums listed above. It was still a bit of a shock and an acquired taste for me, but eventually it clicked. By the time it did, it had long been considered one of the best albums in rock history by various music publications. A long time ago, in a galaxy far, far away, a band would release an album – hopefully a good one – then go on a concert tour heavily promoted by the record company to solidify the record’s place in the music world, and in turn sell more records. Occasionally a live album from that tour would follow. Wash, rinse, repeat. Coming off his 1972 hit album Harvest, fans of Neil Young who bought tickets to see him and the Stray Gators on tour in early ’73 expected a show which featured that album and earlier hits. But fans weren’t fully aware of the catharsis Young was undergoing at the time. While the accepted truth that has developed over the years that concert-goers didn’t hear Harvest songs or any of their older favorites on this tour is a misnomer, neither the set lists nor the vibe of the shows were what they expected. While rehearsing in late ’72 for the upcoming tour, Young dismissed guitarist and friend Danny Whitten from the group, giving him some cash and a plane ticket back to L.A. Whitten, in the throes of heroin addiction, was simply unable to play. Shattered, Whitten died of an overdose of Valium and alcohol the following day, sending an already unstable Neil reeling. And with that, Neil Young and the Stray Gators set out on a three-month, 62 (!) show, tequila-soaked tour, combative with each other from the start. Once the tour began, the band began demanding larger salaries, and as the nightly wake for Whitten wore on, Neil’s voice wore out. Halfway through the tour, drummer Kenny Buttrey left and was replaced by Johnny Barbata. Also, Young enlisted the help of old band mates David Crosby and Graham Nash to assist with vocals. Eventually the album fell out of print and stayed there for years with Neil showing no interest in revisiting the tour. Meanwhile, fan demand for its re-release grew until it finally reappeared on vinyl a couple of years ago, then on CD as part of the Original Release Series a year later. As of this writing, it’s still not available on CD as a stand-alone release. Thank goodness for bootlegs and good ol’ YouTube, since I refuse to re-purchase three albums I already own to get one I don’t. Standouts on the release for me include Don’t Be Denied, L.A., Yonder Stands the Sinner, and the title track. Neil has stated that his Archives Vol. 2 will include the title Time Fades Away II, with different material from the ’73 release. While I like the original as it is, hopefully II would be a fuller example of what a typical show from the tour sounded like. And again, that’s if and when it ever comes out. Either way, the ’73 version is available to anyone who wants to hear it. By the time it originally came out, Young was already further along in the ditch with another new batch of raw, beautifully grating tunes in his exploration of audio vérité. He would continue to meet life’s demons head on, and for this fan it made for great art.